Caught this cool chap at the Cargo Bike Race. Or maybe he was merely browsing the flea market next to the race course. Now I'm not particularly interested in his bike but I asked what kind it was. In typical Copenhagen fashion, he shrugged and said he bought it online but couldn't remember the name. It's not about the bike, it's about you... on the bike. And this bike worked perfectly for him. 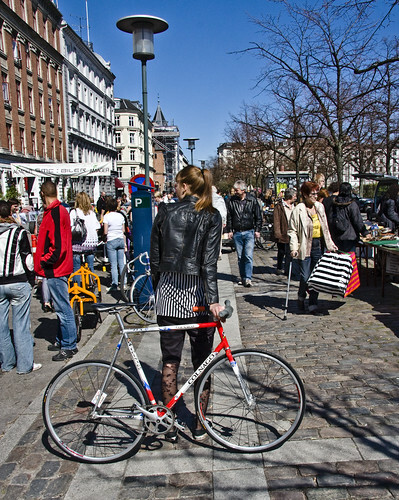 Copenhageners enjoyed the sunshine at the race. Here's a little slice of Copenhagen life. 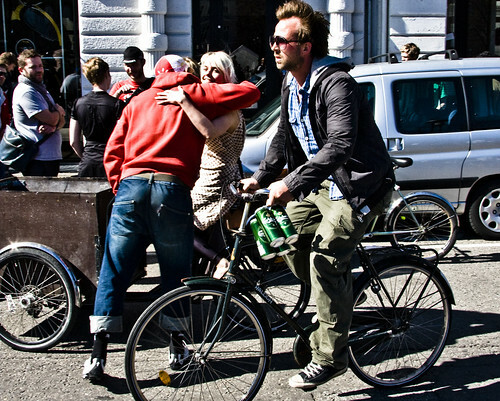 Friend embracing a friend on a cargo bike and another chap speeding past with beers. We have fixies here in Copenhagen apparently. Which is cool. 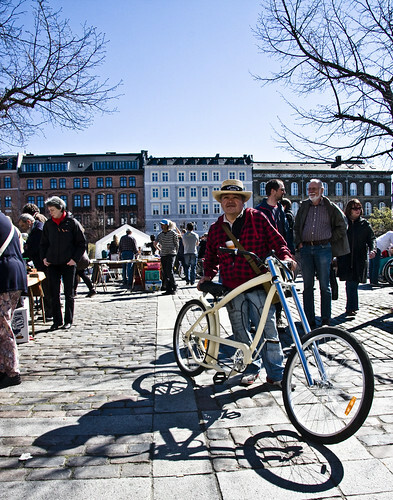 Here's one of the Copenhageners who ride them. If you have one fixie you'll have more...they're taking over the image of casual everyday biking. while the fixie fad is cool in many ways, I doubt that it will 'take over' very much at all. casual everyday biking has remained largely unchanged for more than a century, while fads have come and gone. mini-bikes, mountain bikes, drop handlebar racing bikes - they've enjoyed a period where they were trendy. a certain demographic will embrace them but the vast majority will stick to what they know best and what is easiest and most enjoyable to them. Love the Copenchopper. That is one fun looking bike! Sorry about the fixies. One of them ran into me at a stop light the other day- he couldn't control his track stand. as far as trends go, rolling up one pant leg or baggy trousers are far safer than chucking novices onto bicycles that demand a certain skill.